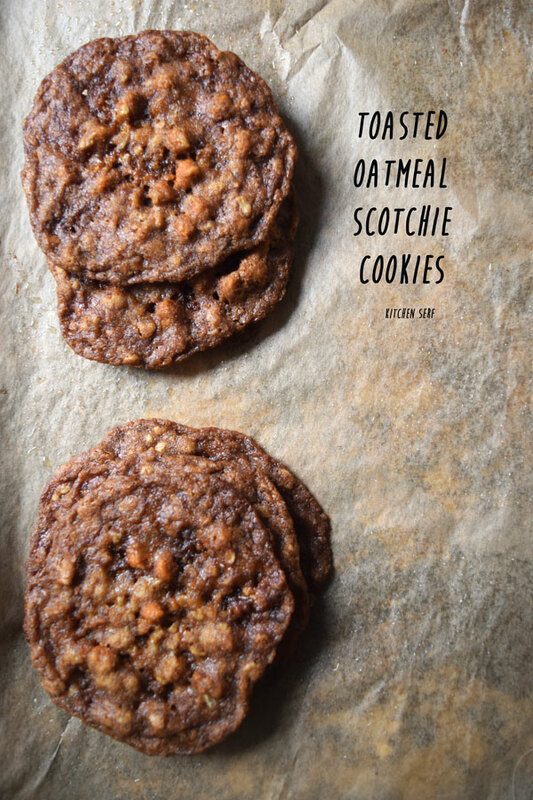 Toasted Oatmeal Scotchie Cookies are everything you want in a cookie: buttery flavor and crispy but chewy texture studded with butterscotch morsels. This post contains an affiliate link. See disclosure. So, I made these cookies, from one of my favorite cookie recipe books, Cookie Love by Mindy Segal, because my kid started high school. 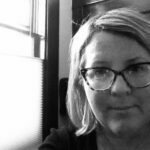 I feel like I’m running out of time to do things that will leave me, at the end of my life, with the Good Housekeeping Seal of Good Motherhood. That’s totally a thing by the way. That’s what good mothers do, isn’t it? Make oatmeal cookies. Of course, the key is continuing to make homemade cookies throughout the entire school year, not just the first weeks. I am glad that I made these particular cookies because they are thin and chewy yet crisp. They would be perfect for making homemade ice-cream sandwiches, maybe with a thick slice of lemon or ginger ice cream in the middle or vanilla. Because the cookies are so thin and lacy, the ice cream sandwich would be manageable to eat for people like me with small mouths or for children. Because the cookies have oatmeal and butterscotch chips and a crazy amount of butter, they are somewhat sturdy despite being so thin and would hold up until the last little bite of ice-cream sandwich. I hate having cookies fall apart when I’m nearing the end of an ice-cream sandwich. It makes such a mess. The school is having a potluck in two weeks. I’m not sure what to bring. I had considered these cookies but there’s a student with an egg allergy who apparently will die if she’s in the same room as an egg or a food made with an egg so I’m not sure what to do. These cookies spread a lot while they’re baking so leave at least two inches between cookies. I bake cookies on a half sheet pan and only baked eight at a time. Don’t skip toasting the oatmeal, toasting the oats adds a flavor dimension to what’s already a pretty sweet cookie. 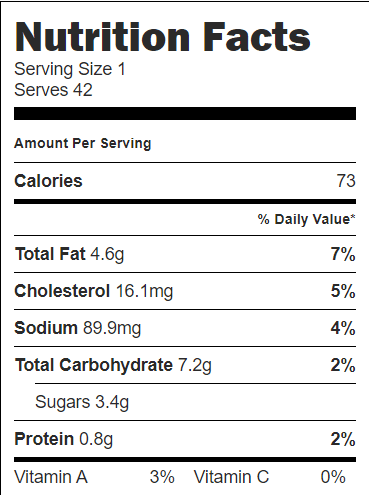 While these cookies were good, I’m not a huge fan of butterscotch morsels or chips, or not at least of the brand I used. I wonder if I would like butterscotch morsels more if I made my own. Heavenly Homemaker has a recipe for homemade. These cookies are so packed with butter, they’re going to leave a residue on your hands, so eat them with a napkin in your hand lest you get oily fingerprints on your outfit. 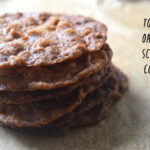 Toasted Oatmeal Scotchie Cookies are buttery, thin, chewy, satisfying cookies thanks toasting the oatmeal in the oven for about five minutes before incorporating the oats into the cookie dough. the oats are a light golden brown. In a mixing bowl, beat the butter for ten seconds, add the sugar and beat for four minutes. Crack the egg in small bowl or measuring cup then add to butter and sugar mixture. Add vanilla. Beat egg and vanilla in the dough for five seconds to incorporate. if using a stand mixer. Add the dry ingredients in one shot and mix for 30 seconds. cookies at a time because the cookies spread a lot. Bake for 8 minutes. Remove pan from oven and tap against the counter to make the cookies fall. 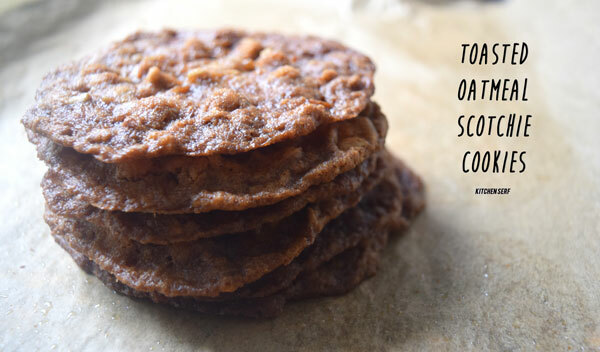 Toasted oatmeal Scotchie Cookies are buttery and satisfying because you toast the oatmeal in the oven before mixing into the cookie dough.